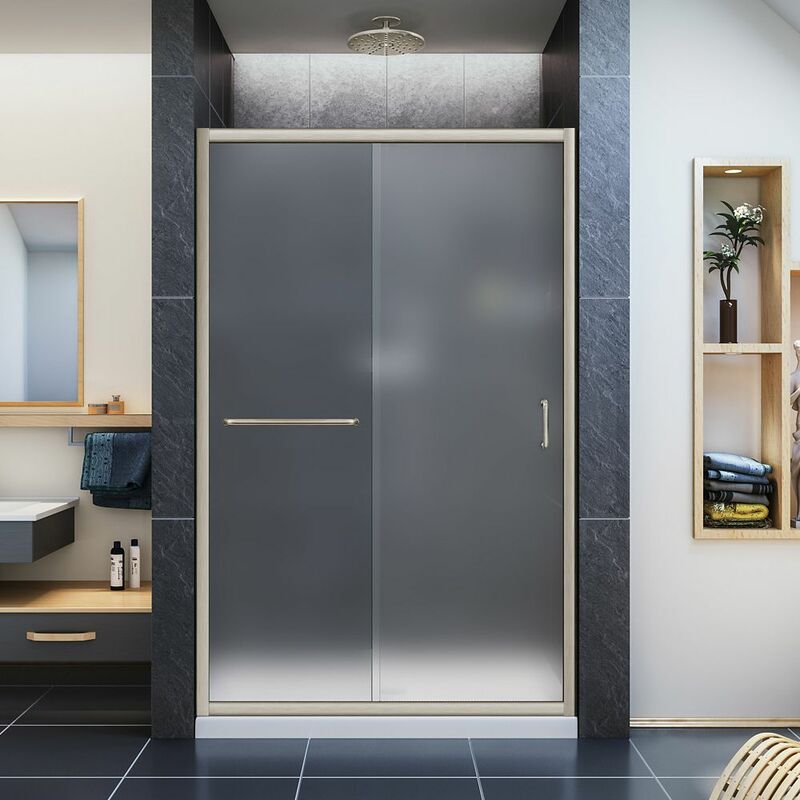 Infinity-Z 44-inch to 48-inch x 72-inch Semi-Framed Sliding Shower Door in Brushed Nickel is rated 4.6 out of 5 by 31. Rated 5 out of 5 by Joe from Very well made quality product. Have had mine installed for a couple of months and no issues. I w... Very well made quality product. Have had mine installed for a couple of months and no issues. I was a little concern before I bought it as I saw one reviewer complain of water getting through between the doors. If installed as directed I am at a lost as to how this can happen. There is a plastic flange that you install along the edge of each panel where they overlap in the middle. Each flange is nearly as wide as the gap between the two panels. If you were to try and stick a coat hanger between the panels you could not as it would bump into one or the other flange. I have turned my shower head so that it sprays against the panels and no water goes through. If installed according to the instructions provided, it will not leak. The walk-in shower unit I installed this on does have small radius (curved) corners at the bottom - about the size of a dime. I had no difficulty in carefully trimming the rail corners with my Dremel tool to get a snug fit, and a little extra silicone inside to insures no leaks. Looks beautiful. Works great. highly recommend! Rated 4 out of 5 by Bryan from Good product. Just be aware that one of the... Good product. Just be aware that one of the doors is fixed. It is not a slide by that you can open from both sides. Rated 5 out of 5 by machosdad from great looking I think you should have a video on your website showing installation. It would be much easier to follow then the instructions. Instructions more complicated than it actually is.